It’s been said that the universe’s ultimate fate is entropy: Everything simply falling apart into chaos. Anyone who’s worked with photographs believes this: There are probably more damaged and unusable photos in the world than pristine, perfectly preserved ones. Sometimes it’s possible to simply replace damaged physical photos with a new shoot. Sometimes it’s not economically smart, or, in the case of older photos, even possible. But if you have a skilled, reliable partner like Back Office Proto outsource your photo restoration work to, you can salvage your damaged photos and save yourself time and money – and possible priceless memories as well! Removal of Stains We can eliminate all evidence of damage in an image that may be caused due to a stain and effectively restore your photos and portraits. Restoring Loss of Pigments and Chemical Coats We can restore loss of pigments and chemical coats to faded photos or old photos whose coatings have peeled or flaked off. 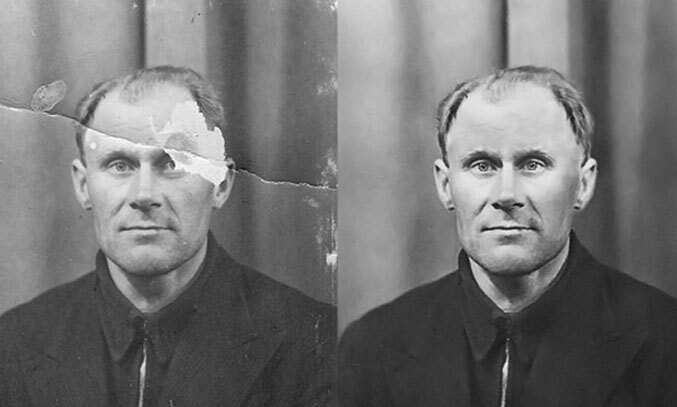 Repairing Color Discoloration We have experts who can restore color to images, especially older photographs, whose colors had faded or damaged over time. Mold and Tears Our services can help you restore images, especially old photographs, that have been eaten by mold and have become discolored. Colorizing We use colorization effects to restore older black-and-white photographs, or photographs that are faded to a large extent. Custom Borders We provide custom borders for your images, especially old photographs, whose original borders are destroyed or faded over time. Album Glue Damage Our services can help you restore images (old photos) that were glued into albums years ago and were suffering from stains and rips. Shake and Bad Lighting Our experts can deliver the best quality images to you by fixing shaky or blurred images, as well as images that have bad lighting. Silver Fish Damage We can erase traces of damages in images of old photographs that were caused by silver fish, and to create polished images. Experience Our team knows everything there is to know about photo restoration, and we challenge you to stump us. Service You don’t know what truly exceptional customer service is until you’ve worked with our team. Value Our rates are the most competitive in the business. We want long-term partners, not one-shot profits. Speed Whether it’s a single special photo or several boxes filled with archives, we hit our deadlines and never have to make excuses. Every moment that passes, we’re losing a bit of history as a photograph passes the point of no return. If it’s a valuable piece of marketing, you’ll have to pay to have it replaced. If it’s a memory, there’s no amount of money that can bring it back. Back Office Pro knows the value of old photos, and we treat them like our own: Carefully, respectfully, and with every ounce of skill we have. Call us today to outsource photo restoration project.